Remember what the summer meant when you were a kid? It meant no school; long, sunny days playing ball with your friends; swimming; family vacations; and the occasional evening at the drive in. 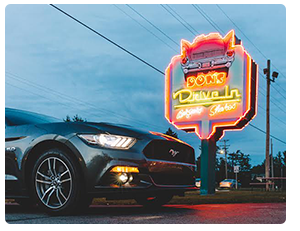 You're all grown up now, but Don's Drive-In takes you back to that time with amazing burgers and real shakes brought right to your car. Don't forget to stop by Dons and pick up gift cards. They can make great Stocking Stuffer's. Available in any denomination. we offer on our delicious food. 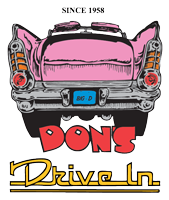 If you've been searching for a '50s carhop with real burgers, real hand dipped milkshakes, and real malts, visit Don's Drive In, located in Traverse City, Michigan. When you roll into our eatery, nostalgia hits you immediately. Don's Drive In was founded in 1958, bringing great food and good times to its customers. Our current owner took over in 1980, and not much has changed since then. It's still a well-maintained location with excellent service and amazing food. 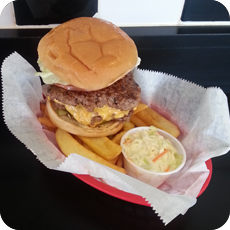 Don's is known for its real burgers and real hand dipped milkshakes. The fresh ingredients make our dishes delectable. We participate with the county fair 4h clubs, and we've won awards from Traverse Magazine for Best Burger, Best Milkshake, and Best Sign in the State of Michigan—people stop and take pictures all the time. We offer a plethora of American food, including grilled cheese, tuna fish, charbroiled chicken sandwiches, Reubens, footlong hotdogs, coney dogs, chicken fingers, and coffee. 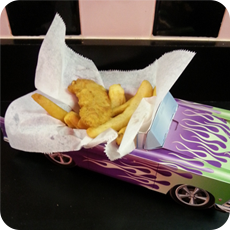 Our friendly staff will bring the food right out to your car. We are associated with the Michigan Restaurant Association and Traverse City Chamber of Commerce. Our mission is to make people happy. Monday - Thursday, Sunday: 11:00 a.m.-9:00 p.m.
Friday, Saturday: 11:00 a.m. - 10:00 p.m.